Jung Sook Park, left, and Yong Soo Jung lost their business and most of their money within a few weeks - and now may face losing their visas. This past April, the Department of Homeland Security sent a letter to Yong Soo Jung foreshadowing deportation if he could not prove that he was a valid Oakland business owner. In May, Jung’s landlord informed him that he wouldn’t renew the lease for Henry’s Gallery Café, his downtown Oakland eatery, and that he would have to vacate his business. And in June, burglars broke into Jung’s apartment and took nearly everything, including $40,000 in cash, his wife’s wedding jewelry, and even personal photo albums. It was a brutal series of events, leaving Jung and his wife, Jung Sook Park, with no café and only a few thousand dollars in a checking account. 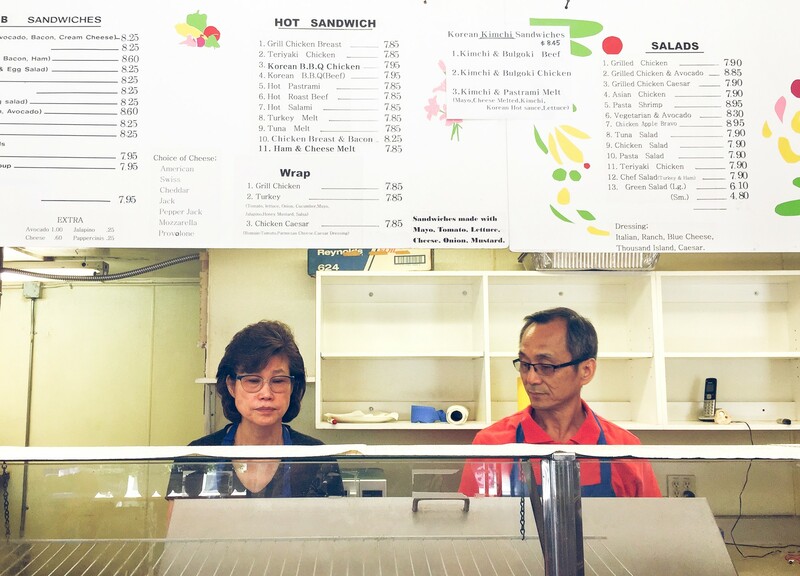 The upshot is that the story isn’t over, with friends and Oakland’s Korean community stepping up to help Jung and his wife raise money and scramble to find a new location for his café. But if Jung can’t open a new business within a year, his visa will expire, and he and his wife will be deported to South Korea. Jung and Park came to Oakland in 2007, hoping to provide their son with a better education. Their son is now 24, and is a senior at UC San Diego majoring in nanotechnology. Upon immigrating, they found a shop for lease on the corner of 17th and Franklin streets, less than two blocks from the 19th Street BART Station. They opened Henry’s Gallery Café, where they served a variety of wraps and sandwiches, some with a Korean twist, seven days a week. Their bulgogi beef sandwich was a particular customer favorite. The couple understands very little English, but spoke to the Express with the help of a translator. They say that, when they signed the café's original lease in 2007, a Korean translator was present. Since then, however, nearly every communication with their landlord was made without one — and this has caused some issues. For instance, in October of last year, Jung and Park met with their landlord, Steven Banker of LCB Associates, to ask for a new lease. The original contract from 2007 was for five years, with the option to extend for another five. Jung says they verbally enacted that extension, but that their landlord told them during the October meeting to wait for another lease negotiation. This past April, Jung says he met with his landlord again, and was informed that he should start looking for another home for his café. But Jung’s impression was that this wasn’t a final decision about the fate of Henry’s, and that he might still secure a month-to-month lease. More confusion ensued. In late April, Jung says he approached Banker — without a translator — and asked for a copy of his previous lease. He needed it because, two days earlier on April 24, Homeland Security mailed him a letter stating that he needed to provide written proof of a signed lease so as to renew his visa. However, Banker had interpreted Jung’s request as asking for a fraudulent lease document. The landlord wrote in a letter reviewed by the Express that Jung asked him to “execute a fraudulent lease for you to give to the Department of Homeland Security,” and that he would never agree to do such a thing. On May 5, Banker told Jung that he would have to leave the premises by July 31, the final day of his current lease. This came as a shock to Jung, who was under the impression that his request for a new lease was still under consideration. He tracked Banker down that same day and asked — again, without a translator — for an extra year. He says he didn’t understand Banker’s response — and, out of frustration, told his landlord that he would see him in court. On June 15, Jung and Park came home after a long day of work to find that their apartment had been burglarized. The thieves took their life savings, cash hidden in a tea kettle; plus the TV, passports, original visa documents, even a bag containing all of their family’s personal photos. Jung, who lives in government-subsidized low-income housing, said that his apartment building has security cameras — but they were broken the day of the robbery. The police took a report, but nothing has come of it so far. According to WookSun Hong, a Korean lawyer at Bay Area Legal Incubator who reviewed Jung’s case, the restaurateur doesn’t have many options to recover what he lost. He added that Banker’s decision to not renew the lease is legal — although he described the landlord only giving Jung two months official notice of this fact as “reprehensible,” since without a place of business, Jung cannot renew his E2 visa. Jung and his family have never returned to Korea since arriving in the United States. They worked seven days a week, so committed to the café that, when Park’s father passed away in 2010, she did not attend his funeral. They also didn’t want to risk losing their visas, Jung explained. Jung has no way to prove that all his stolen possessions actually belonged to him, so being compensated for their full value would be impossible, Hong said. When regular Henry’s customer Amy Newman heard of Jung’s apartment burglary, she and her husband, Brent Noorda, immediately contacted members of the Oakland community to see who could help. They were able to put Jung in touch with Hong, and a friend, Jae Kim, who translated Jung’s interview with the Express. Newman also started a GoFundMe campaign to help them make ends meet. The initial goal was to raise $15,000, enough to pay for one quarter of their son’s final year of tuition. They were expecting to raise at most a few hundred dollars. But by Monday, less than a month after the campaign began, they had raised nearly $13,000. Customers have also been leaving cash tips in lieu of donating online, as much as $300 a day. “He’s so well liked in the community”, Newman said. The retailer in question is a second incarnation of Beauty’s Bagels, the popular Montreal-style bagels eatery run by Amy Remsen and Blake Joffe on Telegraph Avenue. The new downtown spot is set to debut in the former Henry’s location next year. Remsen said that Beauty’s Bagels had been approached by LCB Associates, who only told them that they were looking for a new tenant to take up their Franklin Street space. They were not given any information about the previous tenants, including their reason for leaving. Beauty’s Bagels wasn’t the only company approached by Jung’s landlords. According to Sam Cobbs, chief executive officer of First Place for Youth, a nonprofit organization that helps foster children throughout California, a realtor connected him to Jung’s landlords in July of last year, when Cobbs was looking for more office space. He says they toured the upstairs and downstairs portions of Henry’s, and that the property owners told him that it was not available at that moment, but would be soon. “I took it that that the rent was just skyrocketing, and that they knew they were going to price him out,” Cobbs told the Express. Jung said that he wishes the incoming tenants had been upfront and talked with him directly about acquiring his place of business. He added that he hopes they negotiate better tenant protections than he did. “Regulation is regulation and law is law, but there should be a better way to protect small businesses and have some better morals and business ethics,” Jung told the Express. Meanwhile, on Jung and Park’s GoFundMe page, dozens of customers have left comments in support. Many wrote personal memories about the owners, thanking them for their kindness — as well as their breakfast sandwiches. One commenter, Joey Serra, recounted a time when Jung saw him scratching his head. The next day, Jung brought two Korean dandruff remedies and insisted he try them. “I moved away six years ago and still think about them every time I eat bulgogi,” he wrote. For Newman and Noorda, the next step is to help Jung and Park find a new location to set up shop. Several people have messaged them through the GoFundMe page about potential locations. But with Oakland rents rising, it will be challenging to find a place in a workable location at an affordable price. Jung officially cleared out Henry’s Gallery Café this past Monday. The future is still uncertain, but Jung isn’t willing to give up, and said he is open to any business opportunity that comes his way. “I’m willing to take on another challenge,” Jung said.